They’re unique but I’m betting these Mashed Potatoes with Lemon, Garlic and Scallions will become your new favorite too! The first time I made these Mashed Potatoes with Lemon, Garlic and Scallions it was out of curiosity. I’ve been a loyal reader of Bon Appetit magazine for over 30 years and they’ve seldom (if ever) steered me wrong but it seemed a strange combination of ingredients for mashed potatoes. I loved lemon enough though to give them a try. After completing the dish and of course taking a small taste, I had to put the dish under lock and key so that I wouldn’t finish off the bowl before dinner. Well, maybe a slight exaggeration but just barely. Just one more little bite please? The lemon is obvious but not overly so…and mixed with garlic, green onion and buttermilk it makes for an outstanding side dish. 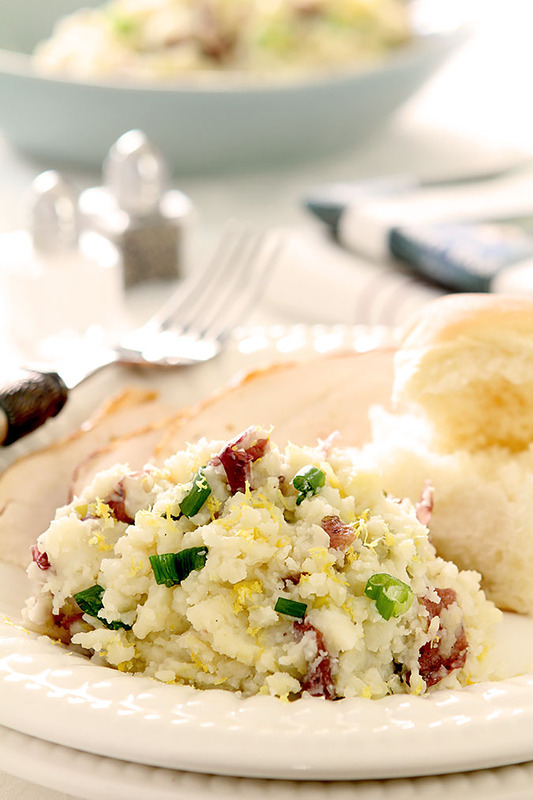 I’ve made these for Thanksgiving on several occasions but realized a couple of years ago that these Mashed Potatoes with Lemon, Garlic and Scallions are really perfect for spring and now the holiday table they would most likely make an appearance at would be for Easter. A prettier potato can not be found! I’ve made a lot of changes to the original recipe but all with keeping the original intent. I used red potatoes since I prefer a sort of chunky, skin on type of mashed potato (what I call them smashed) and think the red skin is prettier. The recipe also calls for chives but I’ve substituted scallions lately since they are always in my fridge. I did up the garlic from the original recipe too. Interesting enough when I asked friends on Facebook if they had one ingredient that they would just out of hand double in a recipe, garlic was often seen on that list. Along with vanilla, butter, salt and more. I felt better knowing my personal proclivity to multiple some ingredients was way more widespread than I had imagined! A most unique flavor with lemon in the mix...and my favorite mashed potatoes! Chopped green onion and lemon zest for garnish. Melt 3 tablespoons butter in heavy small skillet over medium heat. Add garlic and sauté 1-2 minutes; do not brown. Take off heat and mix in lemon peel, then green onion. Set aside. Cook potatoes in large pot of boiling salted water until tender, about 20 minutes. Drain. Return potatoes to pot and mash roughly; these are not meant to be the consistency of regular mashed potatoes. I actually use a metal mallet meant for tenderizing meat to literally smash them. Add onion mixture, buttermilk and remaining 3 tablespoons butter and mash together. Season with salt and pepper. Garnish with freshly grated lemon and green onion. While we love these potatoes with a meal; I think I almost love them even more the next day if we have leftovers. Mix with an egg, pat potatoes into a patty shape, dip into egg wash and then panko crumbs and fry them either in a combination of butter and olive oil until browned for a great addition to your breakfast the following day! I just made these for Thankgsiving and my big baby boy ( who is 24) just came in and tried to take a whole bowl. Yup, these are permanently a part of my home!! Really glad you loved this recipe Betsy; it is one of our favorites. I don’t even save it for the holidays necessarily but nonetheless it will show up at either Thanksgiving or Christmas in our home; I’ve created some expectations! The first thing that struck me about this post were the photos. Absolutely beautiful. That got my attention, but when I read the ingredients in this recipe, I was intrigued. I would never have thought about putting lemon with potatoes, but I can imagine it’s delicious! Great post, Barbara! Thanks so much Bill for the sweet compliment and believe me; it was a HUGE leap of faith but one I just love. Try it, you’ll see! Really nice light on that top photo. Worthy of this recipe — love the use of lemon in this. You done good. Thanks. I would never have dreamed this up but I just love the idea of the lemon, garlic and scallions in those potatoes. It seems odd doesn’t it but once you taste it, seriously…an OMG moment! Aw thanks Bonny; cooking I’m experienced at; learning food photography has been fun but a real challenge. Hi, I just wanted to let you know that I have made your recipe for a linky party challenge, for the ultimate mashed potato recipe. I had never come across lemon in potatoes before so hopefully others find it as great an idea as I did. The link party is http://momscrazycooking.blogspot.com/ and I thought these mashed potatoes were really awesome! I am an avid Bon Appetit reader and cannot believe I MISSED these! However, now that I have seen them on your blog, I am making these… like this weekend!! All my favorite flavors rolled into one!! These look SO yummy, I can’t wait to try the recipe. What a great combination of flavors!! As soon as I saw this, I thought of the recipe for Cream of Leek and Potato Soup in the cookbook “From Our House to Yours” and the lemon made perfect sense. Thanks for sharing! Oh, yes! And I think I’d like these even better with the green onions in place of chives. Absolutely have to try these this weekend. You are so good with family-style dishes, love the flavor combo and I’ll add this to my recipe box along with your Cilantro Rice. As always, great photo! I’ve always operated under the premise that plain ol mashed potatoes are so good, why add any flavor to them at all. BUT, this past weekend we went to dinner at friends and she made mashed potatoes from the Co. Collage cookbook that had carrots and chilis. Delicious and I’m ready for any mashed potato combo. Thanks Lea Ann…and I’m with you..until I tried these. You will love them; the lemon brings such an unexpected but amazingly good flavor to them. I love mashed potatoes! Good recipe to try in the cooler months.Looks delish! 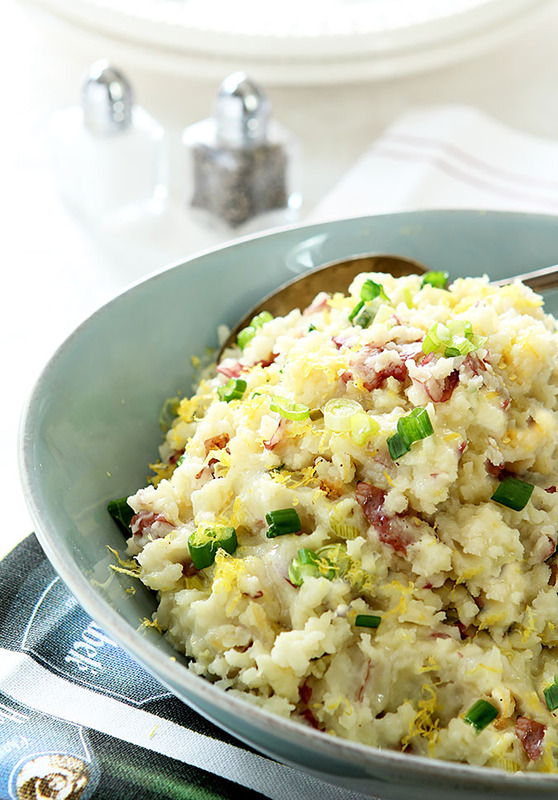 I get so bored with garlic mashed and horseradish mashed…this is a winner! Can’t wait to try the recipe. Oh. My. You’re right – I could eat an entire bowlful or even POTful of this. Now. Oh Barb- your brilliance- er well, Bon Appetit’s- knows no bounds. I am almost embarrassed I have never thought of this simple yet obviously winning combo. Hehe…yeah, well I decided to not peel the potatoes and mash the heck out of them! Brilliant? Or lazy? These look and sound delicious, and easy! I have some buttermilk I made for some creme fraiche… might need to put some in here! Great post, Barbara! Thank you Brian, high praise indeed! These sound wonderful. Great combination….I will be trying them soon.